Please visit Gallery IS through the month of February to see a great collection of handmade art and craft. All the work is wearable, from felt boots to painted t-shirts and many pieces of fine jewellery. Buy your sweetheart something unique for Valentines Day. A treasure is waiting to be found. Showcase runs from Feb 4th to Mar 1st, 08. Opening reception is friday Feb 8th, 6-8pm. Everyone is welcome. We are now accepting submissions for our first group show of 2008. Wearable Art is a showcase for jewellery designers, glass artists, sculpture and ceramics and anyone else working in wearable, functional art. All media are acceptable, but pieces must be wearable. For example; beads, necklaces, brooches, bracelets, anklets, hair accessories, and any other imaginative wearable art. Professional, emerging, and student work will be considered. A maximum of 5 submissions please. 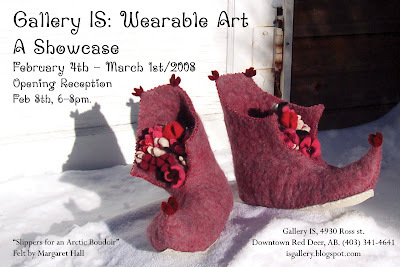 The deadline for submissions to the Gallery's Wearable Art group show is January 26th, 08. Notice of acceptance will be given by Jan 29th, 08. Delivery of accepted artwork must be made by Feb 2nd, 08. Official show dates are Feb 4th to Mar 1st, 2008. Opening reception Feb 8th, 6-8pm.